Australian Dream Weddings - Home Australian Dream Weddings specialises in assisting couples from all over the world, dreaming of a romantic, unique and beautiful wedding in Australia. Australia's Playground in the Sun! Leave all the hard work to us and we will arrange your perfect dream wedding at an affordable price. Australian Dream Weddings specialises in assisting couples from all over the world, dreaming of a romantic, unique and beautiful wedding in one of the world's most desired, popular and safest locations... Australia. With the Australian dollar currently valued low against international currencies, there is no better time to plan your wedding and honeymoon in Australia. We also arrange weddings for couples from all over Australia, who wish to escape and marry in a beautiful destination, away from home. For the couple looking for a truly wonderful wedding, we offer you a range of beautiful wedding locations and services that will make your day truly memorable. We have made the planning process and wedding day easy for you... and more fun than you could possibly imagine. 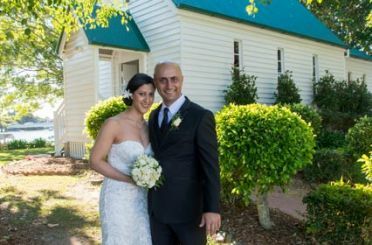 Whether it's just a beautiful, intimate wedding for two, or a special shared gathering for friends and family, leave all the hard work and details to the professional, helpful staff at Australian Dream Weddings. Just an email to pass on our massive thanks for the organisation of our wedding day on the 21st April in Port Douglas. We had the most perfect day, with no stress or hassle! Everybody was so friendly and fantastic - the day ran so smoothly. Plus we love our photos with loads of great comments coming from all over the world from our friends and family. I just wanted to say a big thank you to you and the team who made our wedding on Four Mile Beach such a memorable day! Everyone involved was brilliant and everything ran so smoothly without a hitch. Also, we are delighted with the photos which capture the spirit of the day so well! Our wedding on the 1st February 2008 in Sydney was certainly organised the way we wanted it: no hassle, stress or pressure - only pure excitement, happiness and joy! Please send our personal regards to Vicki, Veronique and of course to Dianne, Pat and Frances who made the photo shoot, recording the video and driving through Sydney most enjoyable and funny!